Sometime ago, we discussed on the prohibition of overly praising a righteous person that may lead to worshiping them. This may sound far fetched an unreal. Ho w can an intelligent human, bring themself so low to worship a creation instead of a creator. Insya Allah, in this session we will further show that people do worship dead righteous people even though many do not see it that way. Perhaps they did not study history or they are merely following their ancestors or their environment without putting much thought to it. May Allah guide us all. 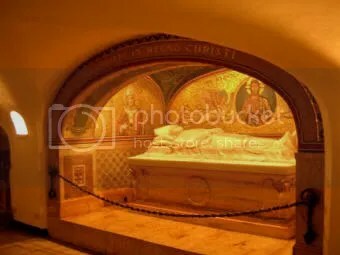 It has become a practice among the Christians, that when a pious person of them die, they would build an edifice over the grave and place and the person’s image in it. This is in order to remember the person and be inspired by the person’s piety. 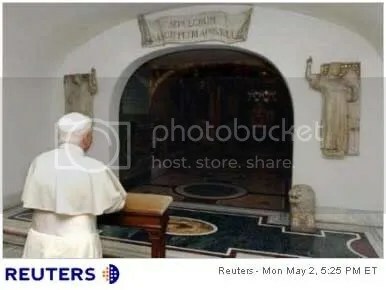 Tomb of S@int Pter in V@tican and a pope praying to it. ii. the sin of making images of living beings – which may lead to the worship of those images, when the original purpose of the construction has been forgotten. Have we not seen this around the world? That people build a worship place after a pious person’s tomb and call them saints, shrines, mausoleum and so forth? ii. It is forbidden to build mosques over graves. iii. If even building a place of worship over the grave of a righteous person, what more if worshiping the the grave’s occupants. 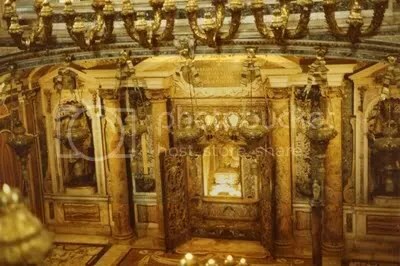 `Aa`ishah informs us in this narration that when the Prophet was near to death and in a state of delirium, he invoked Allah’s curse on the Jews and Christians because they built places of worship over the graves of their Prophets. Then `Aa`ishah explains that the Prophet intended by this to warn his Ummah against doing what the Jews and Christians had done; and she made clear that the reason for his forbidding the Companions from burying him outside his house was to prevent them from taking his grave as a place of worship. i. Prophet salllahu alaihi wasalam was afflicted by the agnies of ilness and death. ii. Prophet sallalhu alaihi wasalam concern deeply about his ummah. iii. His greatest concern is that his ummah will also follow the jews and christians in excessively praising him and building mosques over his graves as a place of worship. If we travel around the world, especially in the middle east area (since that’s where most of the prophets are buried) we will find shrines and tombs of prophets and the sahabahs. Wallahu ‘alam to what people are doing around the tomb. This unfortunately include the muslims and the reason why I am mentioning it to my children is the fear that they will fall into the same error. A’udzubillah! Now what about the graves of Prophet Muhammad sallahu alaihi wasalam and Abu Bakar and Umar at the Masjid nabawi itself? The site was build as a masjid first. In fact their grave was the house of Aisha and Prophet Muhammad and at the spot where prophet Mohammad sallahu alaihi wasalam died and thus buried. The extension of the masjid to accommodate the increasing number of people which is now encroaching the grave area itself. Thus, we must remind ourselves that when we go to Masjid Nabawi, we are not there to visit the grave. Rather we want to do ibadah in the masjid which constitutes of 1000 rewards. We visit the rawdah to make du’a to ALLAH and not to the graves. We face the qiblah and not the graves! We may say salam to Prophet Muhammad ad Abu bakr and Umar as it is the manners of visiting the grave, but we do not ask anything from them. When Prophet sallahu alaihi wasalam knew that the Companions loved him and were influenced by him in everything they did, he began to fear that they might build an edifice over his grave for the purpose of worship as the Jews and Christians had done with their Prophets, and so he expressly forbade the building of places of worship over graves especially his own. This hadith prohibits the building of places of worship over graves because it entails the glorification of their inhabitants. Glorification is a kind of worship, and directing worships to other than Allah is shirk. What it means by still alive at the strike of the Hour, means only the disbelievers are alive at the time of the hour. The believers will have died even for those who have a mustard grain of eemaan in their heart. Those who do so glorify the occupants of the graves, and deify them and seek blessings from their graves. 1. It is favourable for men to visit them, without undertaking a journey to do so, since the graves will remind them of the hereafter. 2. building over graves and burning light over them is totally forbidden because it leads inevitably to shirk. 3. Taking the occupants as intercessors or supplicating to them is an act of major shirk because supplication is a form of worship and directing it to other than Allah is shirk. Again, we see his very act that Prophet sallallahu alaihi wasalam prohibits greatly. We see shr1nes in Iran and Iraq and India where it is build over the grave of their righteous ones. 1mam Hus@yn Shr1ne – Iraq, Karbalā. Mosque built over the grave of second grandson of Muhammad. First mosque here in 684 AD, rebuilt numerous times. Current mosque plastered with gold and adorned with jewels. 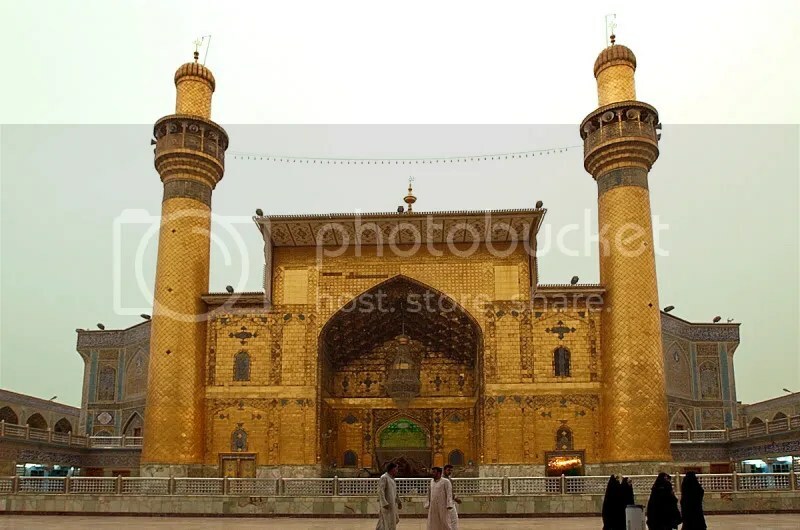 1Imam Al1 Mosque – Iraq, Najaf. Mosque established in 977, here is buried cousin of Muhammad – ‘Alī ibn Abī Tālib, as well as, according to Shi’a belief – Adam and Noah. Current gold covered building built shortly after 1500. One of most important Islam sites. 1mam Rez@ shr1ne – Iran, Meshed. Important religious and theological complex, includes tomb of Imām R1dhā – eighth Imām, the beautiful G0harshad Mosque, theological education institutions and library. Visited by 15 – 20 million pilgrims a year. Developing since 818 AD. 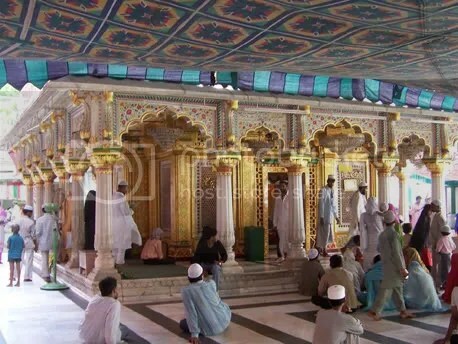 This is a place of worship and minor pilgrimage making supplications and seeking blessings. Jamk@r@n Mosque – Iran, Q0m. 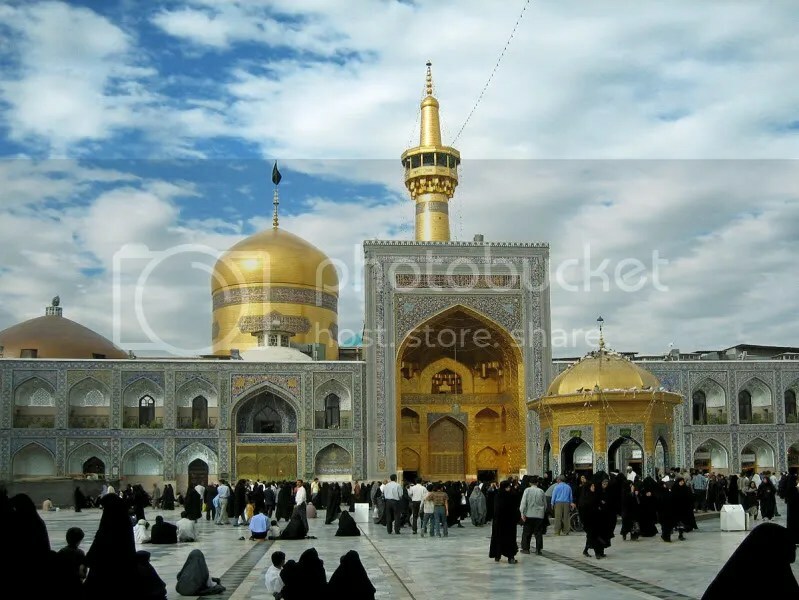 Important pilgrimage site since recent times – locals believe that twelwth Imām – a messiah who wil lead the world to an era of universal peace – has appeared here and offered prayers in the end of 20th century. Sacred place since 984. Also a place for them to seek blessings and making supplications. T0mb of Salim Chishti – India, Uttar Pradesh. Tomb of Sufi saint, beautiful mausoleum constructed in 1580 – 1581. Not to mention, the graves of the righteous people all over the world. Subhanallah! And we wonder how did the people of Noah fall in the trap of shirk. If you ask any of those who visit the tomb/grave/ place of worship, what do they say? They are not asking from them, they claim, they are asking from Allah. That they are alot of reward visiting the graves of the righteous. That those who prohibit them are extremists. Isn’t this exactly like the Quraysh who believe in Allah, but worship their idols who were initially righteous people also? Earlier, the listener was given a preview show of a setting of story that they love to listen to. The Arabs love their horses. They value their mares. Loyal and courageous mares are their priced possession especially in battles. Indeed these horses are a symbol of valour and obedience. They obey their masters in any circumstances. Even if death awaits them. In this verse six, suddenly, Allah diverts the attention from the highly suspense trailer of horse charging into war into the story of the mankind. Allah describes how ungrateful the mankind is to their Lord. Allah reminds them who their master is. The horses depended on their masters for food, drink and their livelihood and in return they are obedient to their masters. Allah is the one who provides sustenance and livelihood, should they also be more obedient and submissive to their Master, the true Lord? But human are an ungrateful lot. كنود – being EXTREMELY ungrateful to the favours of Allah. This verse is not meant only for the Quraysh whom Allah has given ni’mah to them. Among them are their horses. Rather, this ayah is for all of us, of whom Allah has bestowed so many ni’mah that even if you count them, you couldn’t because of its abundance. Are we also ungrateful to Allah? Are we using Allah’s ni’mah to perform sins? From this ayah, Allah begins to speak about what will happen in yaumul akhirah. About all the deeds whether apparent or hidden will be revealed and dealt accordingly. You may notice this word a lot in Quran. So take note of it when you see it next time. Some scholars translate He here to mean Allah. That Allah will bear witness to our deeds. Think about it, the one who is witnessing you now, will also the one to judge you. Have fear to Allah. Some other scholar translate he as human that is we will be witness for or against ourselves in yaumul akhirah. Let us just reflect the verses of quran and imagine our situation in yaumul akhirah. Will our limbs speak against us? Ya Allah protect us. 19. and (remember) the Day that the enemies of Allâh will be gathered to the Fire, so they will be collected there (the first and the last). 20. till, when they reach it (Hell-fire), their hearing (ears) and their eyes, and their skins will testify against them as to what they used to do. 22. and You have not been hiding against yourselves, lest Your ears, and Your eyes, and Your skins testify against you, but You thought that Allâh knew not much of what You were doing. 24. on the Day when their tongues, their hands, and their legs or feet will bear witness against them as to what they used to do. Does this remind of us of surah at Takathur? Talk about Surah AT Takathur. We did surah At Takathur HERE. Knows he not that when the contents of the graves are poured forth (all mankind is resurrected)? Familiar words for you. Give the meaning for each. Where (which surah) did we come across this word before? Where (which surah) did you find this word before? The word حصل means to peel. Like you peel a banana skin to reveal what is inside. Allah knows what is in the heart of men but on yaumul akhirah, Allah will open and reveal what is in the heart of men. 13. and whether You keep Your talk secret or disclose it, Verily, He is the All-Knower of what is In the breasts (of men). And in yaumul akhirah, even the smallest grain of deed will be brought out and so will even the smallest grain of sin. In Yaumul Akhir, Allah who is the All Knower and the All Aware will not leave anything hidden. Do some of us live in this world thinking that we can get away with things. Allah may allow you to keep some things hidden from people, but Allah the one who Witness, the One who knows it all and is Most Aware will also be the judge. On yaumul akhirah, all things will be made known. List the characteristics of a good horse that is favoured especially for battle. What are the characteristics of mankind as described by Allah in this surah? What will happen to the deeds of mankind as described by Allah in this surah? Arabs value their horses particularly the mares. Arabian mares are known to be very fast, loyal to their master and courageous. These are the traits needed for battle. Horses depend on their master for its livelihood. Human also is in need of Allah for livelihood and Allah has given it to them, but yet mankind are continuously ungrateful. Human love their dunya love greaty. On the Day of Resurrection, the grave will be turnover, their contents will be poured out. On the Day of Resurrection, all that is hidden in the breasts will be made known.